When a friend from work sent me a ticket to an event with ‘Mary Robinson’ in the title about a month ago, I got very excited. When I realised that the event was actually seeing Mary Robinson speak in real life I became positively giddy. 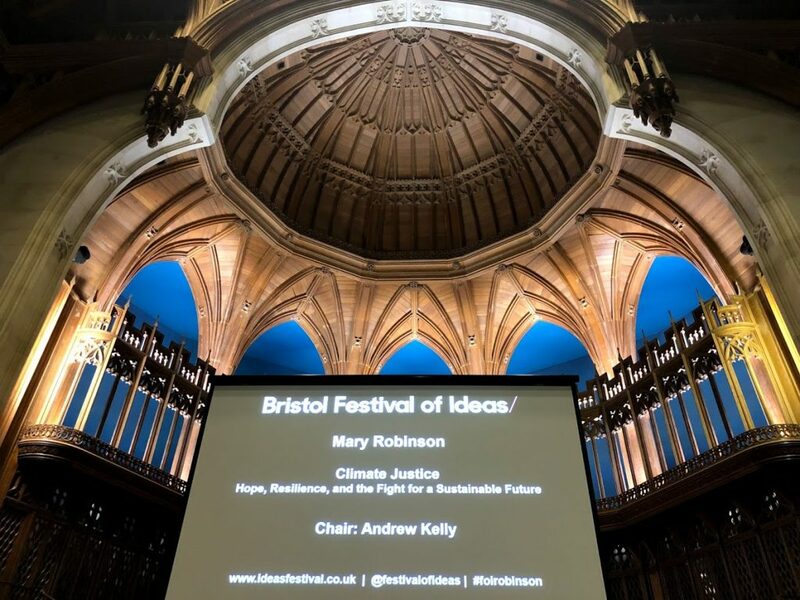 The excitement continued to build until last Friday evening, when I literally skipped through Bristol on the way to see her speak at the Festival of Ideas. I’m not sure if I had heard of Robinson before this year, but since listening to the Mothers of Invention podcast she has become one of my favourite inspirations. She is a climate justice campaigner and one of the women leading the global climate movement (not to mention a whole list of past and present achievements as the first female President of Ireland, previous UN High Commissioner for Human Rights, previous UN Special Envoy on Climate and current Chair of The Elders). Because I am quite a dork I made our group sit right up the front in the second row, and I am so glad I did! If you have listened to Mothers of Invention or read her book on Climate Justice, you will know how engaging Robinson is as she tells the stories of people whose lives are already being impacted by climate change. Here are some of my main takeaways from her talk. The tagline of Mothers of Invention is “Climate change is a man-made problem — with a feminist solution!”. Robinson took a moment to explain exactly how that should be understood. The ‘man-made problem’ part really means ‘human-made’ – climate change is a problem that all of us have contributed to. And the ‘feminist solution’ also needs to involve all of us – everyone can (and should) be a feminist! You can watch her much more eloquent explanation here. Robinson responded to a question on how she maintains hope by referring to a quote by her friend Archbishop Desmond Tutu – “I’m not an optimist, I am a prisoner of hope”. The subtitle of the book Climate Justice is “hope, resilience and the fight for a sustainable future”. 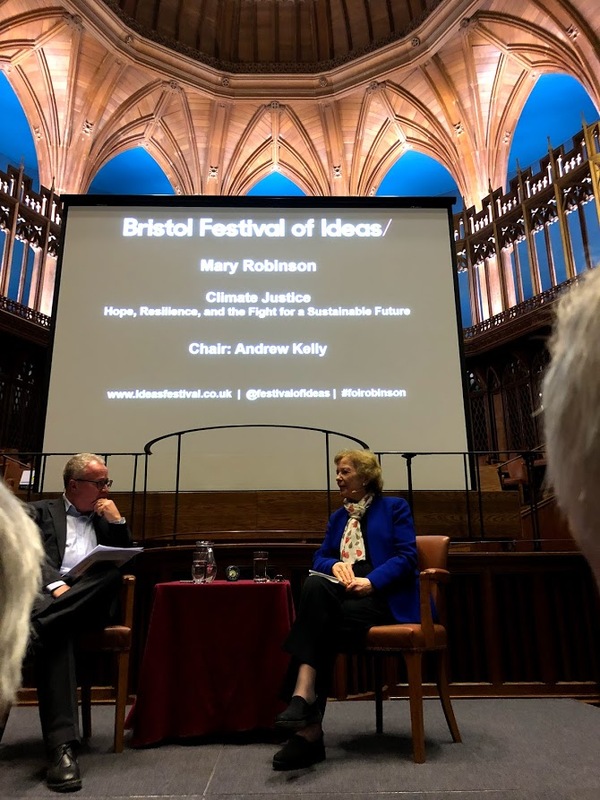 It is easy to feel frustrated and overwhelmed by the constant stream of bad news on climate change, but Robinson showed through stories how individual people can make a huge difference in local communities – and cumulatively those changes will add up. I am trying to get better at points 2 and 3 on the list. I know from experience how behaviour change can spread like ripples – years ago when I decided it was possible to ride my bike 20 kilometres to university, at least four other people subsequently gave it a go. Over the years I have learnt that trying to tell others what to do doesn’t work particularly well. Being enthusiastic about an how much I enjoy an eco-friendly thing is much more encouraging – and much less awkward too! Voting is something I am super passionate about (in Australia we have compulsory voting in elections, I can’t understand why that isn’t the case everywhere) – but what I need to get better at is speaking up in between elections. On the same Friday we went to the talk, school children all over Australia were striking to protest our federal government’s dismal inaction on climate change. Australian politicians might not have got the message, but it caught the attention of people around the world – Robinson even mentioned it a couple of times during her talk. The Mothers of Invention podcast is one of my absolute favourites. There is only one season of six episodes so far, but at the talk Robinson promised us there would be another in the new year. The book Climate Justice is a very accessible read, within it Robinson tells the stories she expanded on during her talk. I didn’t think it was possible for a book about climate change to make me feel so energised and hopeful! If you are looking for more books about climate justice, Mary Robinson recommended this list of five books.